Overview: 2018 represents the largest group of Medicare Accountable Care Organizations (ACOs) to date with 649 across the entire nation. 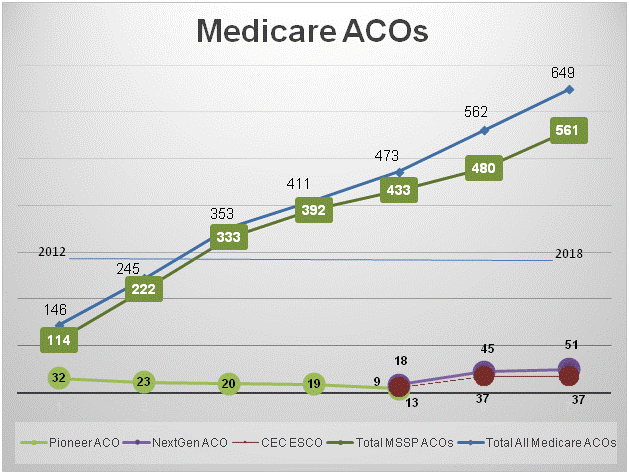 The Medicare ACO program has grown over time with new ACOs joining each year and with the introduction of new ACO models/tracks. As of 2018, approximately 12.3 million Medicare beneficiaries are part of ACOs, representing over 20 percent of Medicare beneficiaries. Background: In 2012 the Medicare Shared Savings Program (MSSP) launched to establish a permanent program that develops a pathway for groups of healthcare providers to voluntarily become ACOs in Medicare. In 2016, the Center for Medicare and Medicaid Innovation (Innovation Center) established the Next Generation Model and the Comprehensive End Stage Renal Disease Model (CEC) to test the effectiveness of additional ACO models. Track 1+ is new for 2018 and represents a two-sided model with lower amounts of risk than the other two-sided ACO models that require repayment of losses beyond a certain threshold. NAACOS long advocated for developing such an option and was instrumental in shaping Track 1+. NAACOS began in 2012 and as of 2018 is proud to count half of all Medicare ACOs and over 60 percent of ACOs taking on two-sided risk as members of the association. MSSP Tracks 1+, 2 and 3, the Next Generation Model, and CEC each qualify as Advanced Alternative Payment Models (APMs) under the Quality Payment Program established under the Medicare Access and CHIP Reauthorization Act of 2015 (MACRA). Eligible clinicians that sufficiently participate in Advanced APMs may earn bonuses and qualify for exemption from payment adjustments under the Merit-based Incentive Payment System (MIPS). The following table and diagrams show the 2018 Medicare ACOs in each of the programs and tracks. In 2018, there were approximately 10.5 million beneficiaries attributed to MSSP ACOs, 1.8 million beneficiaries attributed to NGACOs and an estimated 50,000 attributed to CEC ACOs, representing a combined 12.3 million Medicare beneficiaries in ACOs. ACOs are comprised of groups of providers, which can include medical group practices and hospitals, that voluntarily come together to form the ACO. Some ACOs may be comprised of a single participant, or Tax ID Number (TIN), but many ACOs are comprised of multiple TINs. In fact, Medicare ACOs in 2018 have a mean of 37 participants and a median of 19, figures which are fairly consistent with the past few years. The following table details the underlying sub-totals by track and model. Within MSSP, the Track 1 has continued to grow annually with steady increases in the number of physicians, beneficiaries and ACOs each year. MSSP Track 2 has had less participation than the other two-sided MSSP options, tracks 3 and 1+. Those have had stronger participation, which includes a notable initial Track 1+ class in 2018. Under current government rules, ACOs may only remain in Track 1 for a maximum of six years (two, three-year agreement periods). There are 82 ACOs that began MSSP in the initial program cohort and remain in Track 1 during their sixth participation year in 2018, which means they are required to assume risk beginning in 2019 or exit the program. NAACOS has concerns about forcing ACOs into risk before they are ready, and we have repeatedly advocated to allow ACOs that meet certain cost or quality criteria to remain in Track 1 for an additional agreement period. Over time, there have been transitions between tracks and models with many ACOs participating continuously over the years across various models and tracks. While CMS does not publish official statistics about the number of exits each year, NAACOS and others have noted concerns about turnover each year of the program. ACOs select their model or track based on their analyses of the opportunities, costs and implications of participation. However, it’s important to note that there are limits on when ACOs can move from one model or track to another. For example, MSSP Track 1 ACOs are only permitted to move to tracks 2 or 3 at the start of a three-year agreement period. However, Track 1 ACOs were able to transition to Track 1+ in 2018 during their agreement period, and MSSP ACOs were able to move to the Next Generation Model during their agreement periods. Table B below describes some of the journeys ACOs have taken over time. This table shows some of the predecessors of the 2018 ACOs. 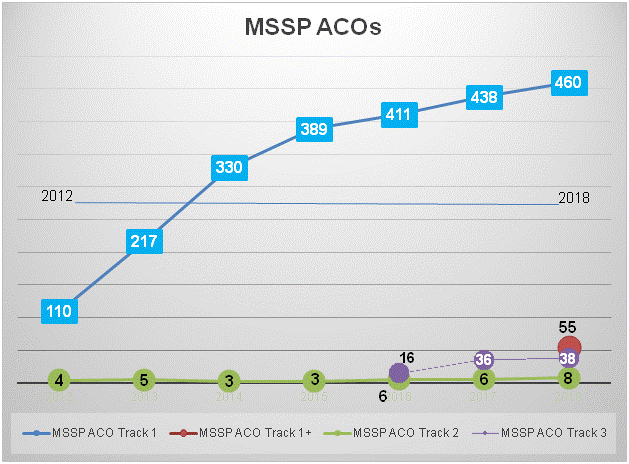 For example, of the 51 2018 NGACOs, 15 of them were either Pioneer or MSSP Track 1 ACOs in 2012. Some ACOs have departed the program for a year or two and then returned, sometimes in a new track or model and frequently in the same model and track. Mergers and name changes also contribute to difficulties accurately tracking ACOs’ year over year presence in the programs. In summary, 2018 is a year of significant growth for ACOs, based on increases in participating ACOs and the number of beneficiaries they cover. Moving forward, we expect to see continued growth of ACOs engaged in value-based contracts - and not just with Medicare but also with employers, local and state government agencies, Medicaid and commercial payers. NAACOS looks forward to continuing our work to support these ACOs by advocating for policies to support them, sharing best practices and educating ACOs on how to achieve success.